Clear skies and a bright and shining sun are the ideal conditions for a game of golf. Unfortunately, bad weather is unavoidable. Rain, harsh winds, and a low temperature can all have an effect on the way you play. It can completely ruin the technique that you’ve spent years practicing and make otherwise great shots turn into duds. 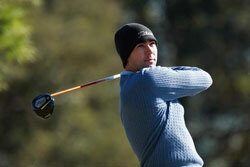 Furthermore, bad weather conditions often leave golfers a bit wary. It can play with your confidence, causing you to make rookie mistakes. This is often due to inexperience playing in unfavorable weather. While you can’t control the weather, you can certainly work your way around it. There are a number of ways to get around unfavorable weather. Whether it’s rain, wind, or cold, there are various steps you can take to improve your game. Small changes can have a big effect. With these tips and tricks in mind, you can play with the same skill and technique as if it were a perfectly sunny day. Heavy winds can be a huge headache on the golf course. If you’re not careful, a powerful gust can take your ball out of your desired trajectory and throw your whole approach off track. Moreover, winds can make it difficult to concentrate or even get around the course safely. While many golfers will opt to practice in a golf simulator as an alternative to playing outside, you can learn to dominate a windy course. Here are a few tips that can help you manage. Being left out in harsh winds without any protection isn’t a comfortable feeling. Depending on the severity of the wind, it can be difficult to simply get a clear view of the course. You need to stay protected so that you’re comfortable enough to make a shot. There are a number of things you can do to stay comfortable. Glasses are a great way to protect your eyes. They’ll keep the wind from drying your eyes out, allowing you to see clearly. Windbreakers will keep your body comfortable and prevent you from feeling the chill. To maneuver around and create a wind barrier, invest in a windproof umbrella. These unique umbrellas are designed to withstand inversion. It’s done through ventilation or clever redirection. Either way, they’ll keep you shielded from the wind with no problems. 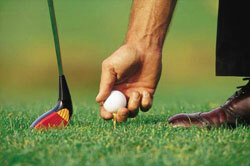 Instinctively, you may think that you need to hit the ball harder in order to get past the wind issue. However, this can actually do more harm than good. This form of overcompensation actually causes the ball to get more height at the expense of distance. This is because of backspin. With a hard hit, you’re causing the ball to spin faster. When headwind is put into the mix, the ball will rise up. To combat this, back off on the power a bit. Hit the ball at about 80% of what you normally would. This results in a low-flying ball that gets more distance. Going with the same principle of avoiding height, you can change the position of the ball in your stance. Rather than placing it forward and aligned with your left heel, pull it back. You should also position your body weight more forward. These two steps result in a shot that’s low to the ground. You’ll achieve less loft, which is beneficial if you’re faced with headwinds. Too much height will only cause the ball to lose distance and create more chances for the ball to be thrown off your desired trajectory. As mentioned earlier, it’s important to hit a bit lighter than normal in windy conditions to prevent backspin and high loft. Because you’re doing this, it’s a good idea to choke down. By holding onto the club a bit lower, your swing is going to be significantly stiffer. In normal playing conditions, this isn’t good. But in windy conditions, it provides much more control. Without the typical flexibility of the shaft, the club will whip back much less. This results in a slower clubhead speed. You won’t be able to swing as fast as normal, resulting in a lower loft and much more control of where your ball goes. In many cases, you can use the wind to improve your shot by simply going with the flow. To do this, you have to understand how the wind is traveling. Pay attention to the speed and direction it’s flowing. If it’s blowing in a direction you need to take the ball, just ride the wind. This is especially beneficial if you’re on the edge of the green and need to bring the ball back in without losing distance. Alternatively, you can hit the ball so that the wind fights it. If you need to hit a straight shot, hit the ball with a sidespin. The spin should be opposite to the direction of the wind. This sidespin will fight the breeze and make the ball go relatively straight. Rain is a unique obstacle to overcome during a game of golf. Wet grass easily becomes a slippery hazard that can throw off every aspect of your swing. The best way to prepare for a game in rainy weather it to stay protected so that you can focus on making a clear hit. Failure to protect your body in rain could lead to some significant issues. You’ll eventually get cold, start shivering, and ultimately get sick. The best way to protect your body is to dress up in layers. A tight layer against your skin will take care of any perspiration while also keeping you warm. You can then add a traditional golf shirt and outerwear. When it comes to rain jackets, keeping it light is essential. Bulky jackets will only get in your way and weaken your game. Instead, go with a light jacket that offers optimal protection. Windbreakers are a great option because they help cut the wind while resisting water penetration. When it’s cold and wet out, you need to keep your hands covered. Golf is all about having contact with the club and feeling your swing. You can’t do that with numb hands. In most cases, a traditional leather glove will not do. It’s important to invest in a heavy-duty glove that doesn’t affect your playing. There are a number of great golf gloves available that are made for less-than-desirable weather conditions. These waterproof gloves will keep your fingers warm and improve your grip onto the club. They prevent water from entering and create a strong seal around your wrist to keep your hands and fingers toasty at all times. The biggest issues you’ll face on the course when it’s raining is losing your balance and having water enter your shoe.While it may not seem like a huge issue, water in your shoe can cause your body temperature to drop and affect your overall comfort level. It can distract you from the game and cause you to make bad shots. Waterproof golf shoes are sealed tight to prevent moisture from entering. They also have great outsoles that can hold onto the ground for stability. The grass on a golf course gets slippery quite fast. Not only will it be difficult to walk around, but you can lose your balance as you make a swing. Even a small slip on your stance can change the trajectory of the ball. Waterproof golf shoes have an outsole designed to improve traction on the course. If it’s possible, keep yourself covered. This can be done with a high-quality umbrella. 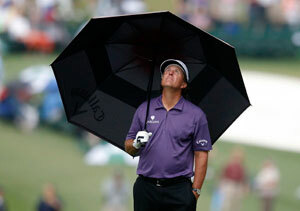 Many golf push carts are equipped with umbrella holders that can shield you from the wind and rain as you make a shot. It’s also a good idea to keep your gear protected. This can be done with a waterproof blanket, plastic covers, and much more. Covering your equipment will ensure that nothing experiences significant water damage. Playing in cold weather is a tricky feat. The cold has a much more drastic effect on your body than wind or rain. If you’re not prepared, you may find your body shivering and mind out of focus. While many golfers hang up their clubs during the winter months, it’s completely possible to play in cold weather. Those extra few months of practice will prove to be beneficial when its peak golfing season. Obviously, the best way to approach cold weather is to keep warm. Multiple layers of clothing will regulate your body temperature and allow you to control how much of the weather you feel. You can always take off layers as it gets warmer. With that being said, it’s important that your layers don’t affect your game. Too much bundling will make swinging an unnecessary challenge. It’s good to stick with thin layers. Because you’re using multiple layers of protection from the cold, each layer doesn’t have to be incredibly thick to provide adequate insulation. Ensure that you cover every part of your body from your head down to your toes. Most of your body temperature is lost through your head, so wearing a thick cap is recommended. Winter golf gloves are also crucial, as they’ll keep your fingers warm and tactile. You should always keep your golf balls in your pocket or another warm spot if they’re not on the course. Colder golf balls are actually less effective. You may experience up to 5 yards of difference for every 10 degrees the temperature drops. This can have a large effect on the ultimate outcome of the game. To avoid this, keep the balls warm until they’re ready to come into play. When it’s cold out, you need to walk instead of ride. Golf carts, while handy in most occasions, can prevent you from warming up. Walking to every hole will get your blood pumping. Before long, you’ll notice that you feel considerably warmer. If you don’t walk, the cold weather will cause you to stiffen up. This will translate into your swing. To avoid this, just leave the golf cart behind. 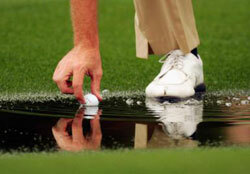 The weather shouldn’t dictate whether you can or cannot play golf. By understanding how the weather acts and how to protect yourself from it, you can keep on playing. In fact, understanding how to play in harsher weather conditions can do wonders for your normal skills and technique. Playing in windy, rainy, and cold environments require you to understand how the ball reacts. So don’t head inside at the first drop of rain or gust of wind. Instead, prepare yourself and finish your game.